It’s safe to say that the National Hunt action has been a bit…um…average since Next Sensation blasted his way to Grand Annual glory. In fact Fairyhouse has already kicked us National Hunt lovers back to life with some fantastic action over the past couple of days, providing us with an excellent warm-up for the impending Aintree Grand National Festival. I covered two races at Fairyhouse for my full NTF Members and I’m happy to say my figures have come back from their enforced sabbatical in fine form, with clear top-rated Gilgamboa landing the Ryanair Chase on Sunday and joint top-rated Thunder And Roses winning the Irish National on Monday. I’m now turning my attention to the three day Aintree spectacular and doors to the full NTF service are currently open so that you can hook on and grab all the Aintree analysis and delve into the top class action using my tried and tested Dosage and Trends approach. …is a bullsh!t statement that you are likely to hear at some stage this week!! It isn’t true and it’s not what the figures tell us. 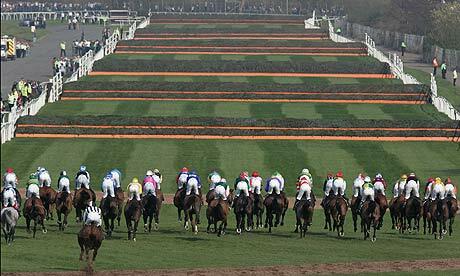 There have been 126 winners at the last six Aintree Grand national Festivals. A huge 74 of them had their last start at the Cheltenham Festival!! 59% of Aintree winners had their last start at the Cheltenham Festival. Yes there were a huge 708 of the Aintree runners that had their last run at the Cheltenham Festival but don’t be sucked into believing a run there is a negative. For sure, Cheltenham can leave its mark on some runners but they do convert above the expected rate at Aintree and it is best to ignore the ‘Cheltenham myth’. Not too shabby I would say. Don’t be suckered into believing a run at Cheltenham is a negative. It could be viewed as a positive to come to Aintree with a set of fresh legs at your disposal but the figures certainly do not back that up and those 120 day+ runners just don’t have the required race fitness to make their mark. You want plenty in your favour to be backing a horse at Aintree off the back of a substantial break. Only six placing is the real worry and fully suggests that the handicap has a firm grip on those runners that occupy the top two slots in the handicap chases. Clearly they are more susceptible to improving types further down the food chain at this stage of the season and those runners whose hands have been firmly masked up until now. You need really firm reasons to be backing a handicap chaser from the top end of the weights at Aintree. Mullins currently owns the Cheltenham Festival. He could enter one of my Greyhounds there and it would probably win (well not Jack, he’s a bit old, but one of the other three!). The same, however, cannot be said about Aintree, he really doesn’t own Aintree. The place figures do bolster things dramatically but for a trainer of Mullins stature that 2.5% win strike-rate is exceedingly poor. He has hinted he may send over some of his superstars this year so can they improve those figures? In truth it wouldn’t surprise me if things improve this year for him (depending on who exactly he sends) but his recent figure are worth pondering over and keeping in mind for sure. Beware – Willie Mullins doesn’t exude quite the same force at Aintree. Mon Mome’s win obviously distorts those BFLSP figure massively. What is worrying for any Venetia supporters is the fact only four others runners have even managed to place at this meeting. That’s a miserable return for a trainer of Williams’ clout. Has she done her work for the year and picked up her profits during the dark and dank winter months? Is her string running on empty by this stage? It’s a shockingly poor set of figures and if it hadn’t been for Mon Mome they would have been a hell of a lot worse! Approach those Venetia Williams runners carefully. It was Grand National morning 2009 and I received my standard text from mother NTF, listing her National picks that she wanted me to put on for her. There were seven of them. Butlers Cabin, State Of Play, Big Fella Thanks, Stan, Musica Bella, Cloudy Lane and Mon Mome. So I said to her “OK, well Cloudy Lane isn’t good enough to win from top-weight and Mon Mome just isn’t going to win, so I’ll put the other five on for you”. 4.00pm comes around and I sit down with Mrs NTF to watch the big one. As the first circuit is complete I think “this race is shaping up strangely, but ah well, still plenty in with chances”. Turning for home the field was bunched up and I turn to Mrs NTF and say “jeezo, anyone of about ten could win from here”. Approaching the last I was thinking the same. …and then it happens. MON MOME bursts from the pack and sets sail for home like he’s just joined in! Phone buzzes. Mother NTF swears via text to me for the first and only time in her life! If your mum wants to back seven horses in the National then you bloody well let her back seven horses in the National! The repercussions are really not worth it!! Hi Ben loved the Mon Mome story. Another Grand National stat that may be of interest, you have to go back to Bindaree the winner of the 2002 Grand National to find a National winner that went on to win another handicap chase. He went on to win the Welsh National in 2003 that aside no other National winner has won another race, Silver Birch did win a PTP at 4/6f 2 years after his National win but I’m not counting that. Glad you enjoyed the Mon Mome story, it still haunts me!! Interesting stat from yourself, Bindaree also one of the youngest winners of recent times so I guess that gave him more scope post-National.